Breakfast with cereal, dried fruit and milk. 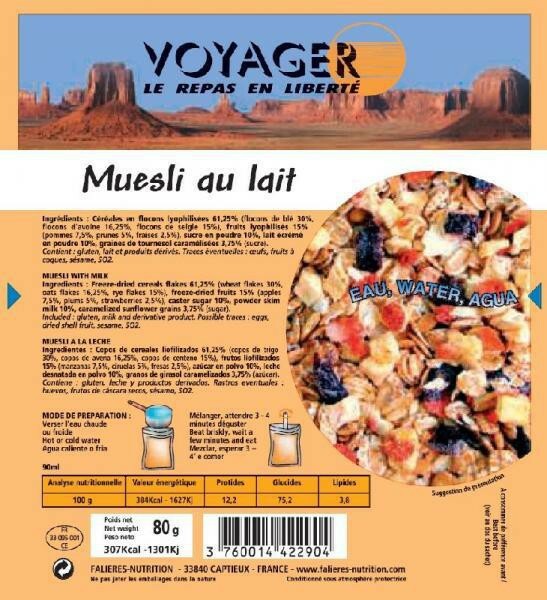 This freeze dried breakfast is cooked with a mix of whole cereals, dehydrated fruits, milk and sugar. Taste this extraordinary strawberry recipe. Also available without strawberries. Freeze-dried cereal flakes 61% (wheat flakes 50%, oat flakes 25%, rye flakes 25%), freeze-dried fruits 15% (apples, plums, strawberries), caster sugar 10%, skimmed milk powder 10%, freeze-dried caramelized sunflower seeds 4% (sugar).